Too often the tone of environmental discourse —Crisis! Dire failure!—promotes hopelessness and paralysis. Brock Bernstein, President of the National Fisheries Conservation Center (Global Ocean Health is a program of NFCC), takes a different view. He was recently asked to write a blog entry for the journal Integrated Environmental Assessment and Management, and we think it’s an important message. One value of getting older is that you’ve seen more and have a longer history to draw on. I grew up in southern California from the 1950s through the 1970s when environmental problems were severe and visible – air pollution (I remember frequent episodes of eye-burning smog that caused incessant coughing fits during water polo practice) and sewage contamination that led much of Santa Monica Bay’s beaches to be permanently closed to swimming (1,2). While I was in graduate school, I visited a colleague in Cleveland in the late 1960s, just a couple of years after the Cuyahoga River caught on fire again, because it was so polluted that, as Time Magazine put it, the river “oozes rather than flows” (Time, August 1, 1969). 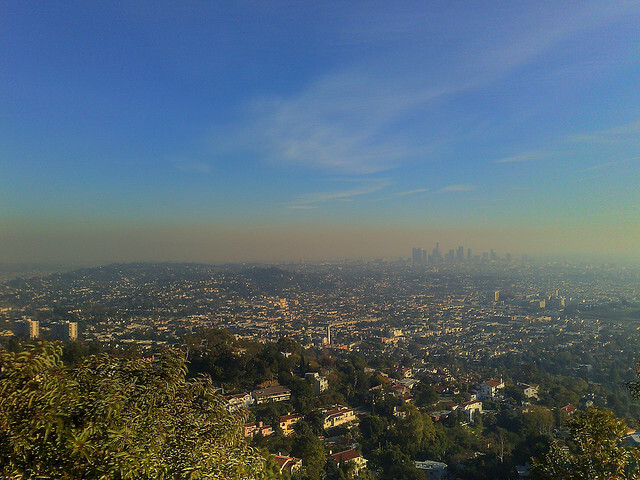 Smog over Los Angeles basin. Credit: Al Pavangkanan, CC BY 2.0. And yet, we’ve solved many of these and other problems that seemed so overwhelming at the time, and we’ve made major progress on newer ones such as the ozone hole. One useful thing about getting older is that it provides some protection against the shifting baseline phenomenon in which our perceptions are dominated by more recent information while the past recedes in our collective memory and is not part of our current awareness. For good reason, environmental advocates typically focus on shifting baselines that cause us to see current, degraded conditions as normal. For example, the average size of top-of-the-food chain fish, such as swordfish, has declined substantially since the 1800s (3), to the extent that most people cannot even imagine a 400-pound swordfish. Yet shifting baselines also diminish our awareness of past successes and the effort that went into them. My son and his friends were only vaguely aware of southern California’s decades-long battle against air and water (2) pollution. As a result, they have no experience of hard-won success to draw on as they consider what their future holds. And because they’re not in the engineering facilities and meeting rooms where solutions to California’s current extreme drought and likely drier future are being crafted and implemented, they—and much of the rest of the public—don’t appreciate the stunning speed with which solutions such as stormwater capture and the potable reuse of treated wastewater are being developed and implemented.